Toronto's Greek community always does things in a big way and the Greek Town Cavalcade of Lights display is no different. While some neighbourhoods are content to simply affix some festive lights to their lampposts, the Danforth gets some special treatment at a community meeting place. 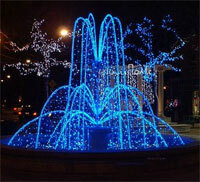 While the lights that hang over the main thoroughfare along Danforth Avenue feature blue and white lights made to look like olive branches, it's the fountain in Alexander the Great parkette at the corner of Logan and Danforth that is the hilight of the display. Covered in energy-efficient blue LED lights, the fountain, which by day is a great location to sip a coffee or people watch, looks as if it is flowing, and the surrounding trees are decorated with blue and white lights in a longer shape that look like leaves. This is truly one of the most striking displays of the whole festival and definitely worth a visit if you're in Greek Town enjoying a nice dinner.